If you think the best part of any meal is dessert, then these New Mexico restaurants will tantalize your taste buds with delectable sweet treats. Check out the dessert menu before you order and save room for an end-of-meal indulgence! Here are our favorites. Right after you make the left turn off Highway 70 heading into town, keep your eyes peeled for a tiny cottage with a small sign in the window that says cafe—that’s Tina’s Café. Don’t be fooled by the exterior. Step inside and you’ll smell the aromas that happen when food is homemade. Dessert here is all about pie, which are indeed made daily. Green chile peach and apple pie top the list of favorites, but the red chile pecan pie is not far behind. All three blend the sweet and spicy to perfection for an incredible taste that will having you coming back for more. Take a slice or a whole pie with you for an anytime snack. The proof of any pudding is in the eating. Once you try the signature dessert, Butterscotch Budino, at this artisanal pizzeria, you’ll realize just how spectacular it is. Budino is Italian for pudding, but this treat is not your standard fare. The thick, rich creamy confection is smothered in a caramel sauce studded with large crystals of sea salt, then topped with fresh whipped cream and a sprig of mint. Cap off a meal of your favorite pizza with his deep buttery, velvety sweet delight. Sometimes it’s fun to have dessert as a first course instead of the last, and this is the place to do it! Since 1998, the family-run restaurant has been making all sorts of handmade pies. The rolling pins are in use all day, flattening dough for dozens of different fruit, cream, and chile pies. Favorites include New Mexico apple with green chile and pine nuts, cheer-y cherry, peachy keen, chocolate chess with red chile and coconut, chocolate or banana cream. There’s even a pie bar where you can pick a favorite slice or two. Add a scoop of ice cream and make a meal of it. This lovely Santa Fe landmark has been delighting diners with extraordinary food for more than 30 years in a historic adobe. Throughout the years, though, with a full-time pastry chef, this delightful restaurant has become famous for its desserts. Handmade ice creams, mousses and sorbets are specialties, but the piéce de resistance is the “Daffodil Cake.” It’s a blend of marbled angel food and a light and airy chiffon cake served with lemon mousse and topped with a creme chantilly and fresh berries. Owner Elisa hails from the South, so in addition to fried chicken, collard greens and red beans and rice, you’ll find an eclectic selection of traditionally southern pies. Shoo-fly, pecan, old-fashion coconut creme, peach and sweet cherry are standard. The one to get, however, is the Millionaire pie, ambrosia in a pie crust. This no-bake pie has coconut, pineapple, maraschino cherries and pecans that are folded in cream cheese then whipped and spooned into a graham cracker crust. Those red and gold chunks of cherries and pineapples look like sparkling rubies and gold nuggets … perhaps the reason behind the name. The word nymph conjures up visions of frolicking spirits. Imagine those spirits as sugar crystals dancing across your taste buds. That’s how good the desserts here are. The triple layer chocolate cake is transformative. You might not ever find a better cake in all your travels. The light and airy cake is layered and topped by a rich and decadent chocolate frosting. One slice is enough for two to four people, but you might not want to share this giant slice of dessert ecstasy. If chocolate isn’t your thing, the organic carrot cake with a liberal topping of tart cream cheese frosting is a good second choice. New Mexico’s official state cookie is the biscochito. It received that designation because it is so mouthwateringly good. The butter-based dough (or lard-based depending on the chef) is flavored with cinnamon and anise and baked to a crisp perfection in the shapes of stars and crescent moons. The Chavez family, owners of this delightful bakery, have been making these traditional Spanish cookies for more than 30 years. Order some with a cup of hot chocolate for a customary end to a New Mexican meal. Take a bag for the road, you’ll want more. Close to 30 hand-crafted ales and lagers are available at this local brewery. Not dessert fare, except when their house-made root beer is paired with vanilla ice cream and morphs into a root beer float. That cool, refreshing summertime memory is recreated as a dessert at this local pub. The base beer is an intriguing blend of flavors with hints of anise, sarsaparilla, wintergreen and sassafras. Once poured over chilled ice cream, it creates a frothy head that, spills over the rim of the glass in an effervescent river of deliciousness. Licking the glass is appropriate. 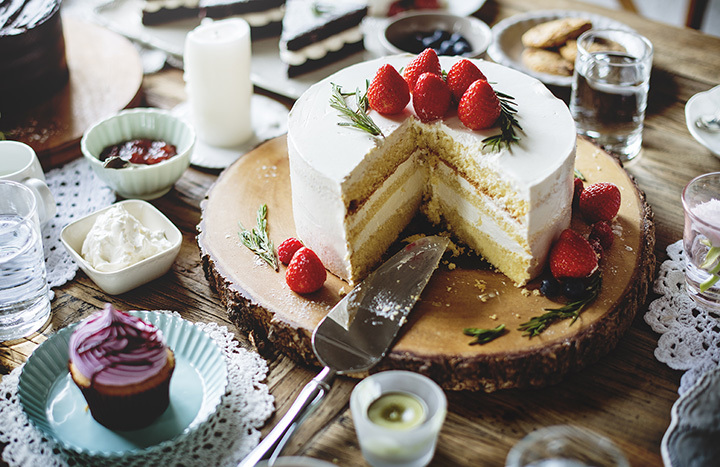 A buffet table is a landscape of possibilities, and the dessert end of the table is a tantalizing draw for the taste buds. The scenery of sweet treats here includes pies, cakes, brownies and cupcakes, enough to graze on until sugar overload. At the top of the list to try is the red velvet cake, a mouthwatering mix of a buttermilk, butter, cocoa cake with a bright red color and a rich cream cheese frosting in between and on top. With roots in the South, this dessert is all about comfort. The menu at this eclectic restaurant is full of global flavors … a little Asian, a little southwestern and a bit of the Florida Keys in the form of Key lime pie. It’s a refreshing as the Keys. Bright and breezy with that tart Key lime tang, a hint of ginger (their secret ingredient) and a buttery graham cracker crust, this is a fresh, sparkling dessert to end a meal with. But … there’s also a black rice pudding with fresh strawberries, whipped cream, toasted coconut and a hint of red chile on the dessert menu. Hmmm, Florida Keys or Southwest flavors. What a great dilemma.